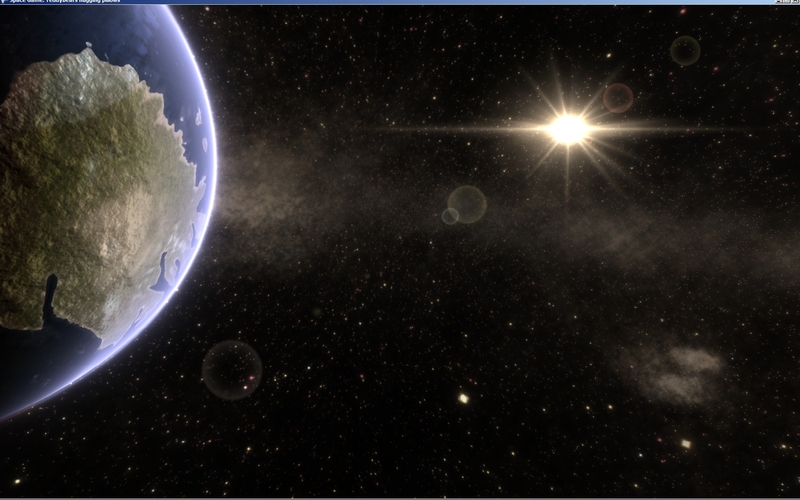 Planet screen, rendered in realtime. 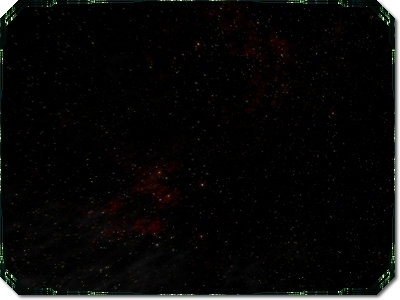 Hit Escape and you're instantly brought back to the galaxy screen (below). 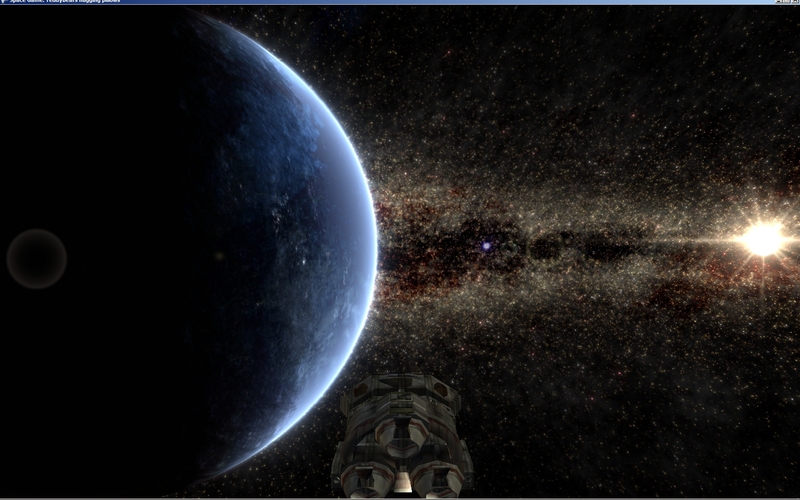 The exact same scene as from the planet screen, but viewed in the Galaxy renderer, third person screen with ship movement etc. 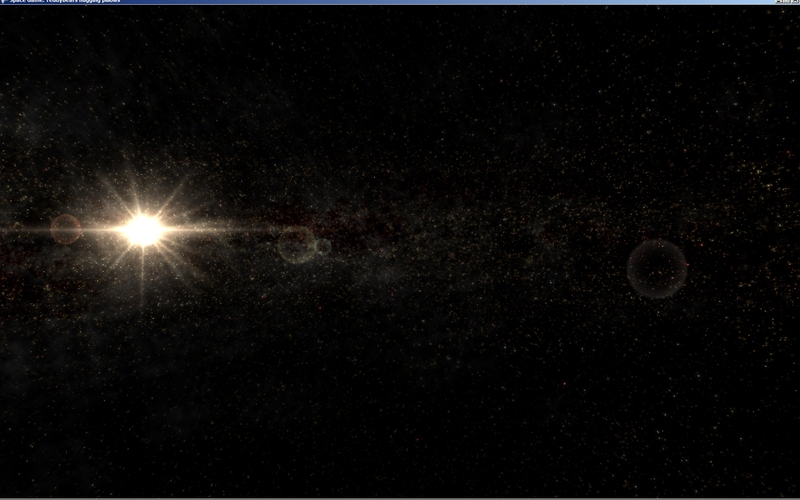 This is the new atmospheric glow effect for planets, being rendered in realtime. This shot shows some red supernova remnants in the background with extra stars drawn around them. Another shot of red supernova remnants. 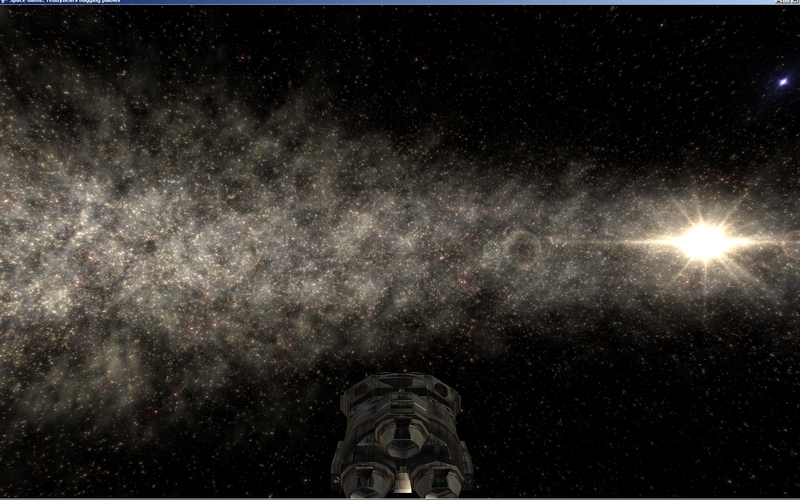 Developed a new procedure for rendering the background in stages of gas, opaque dust and stars. 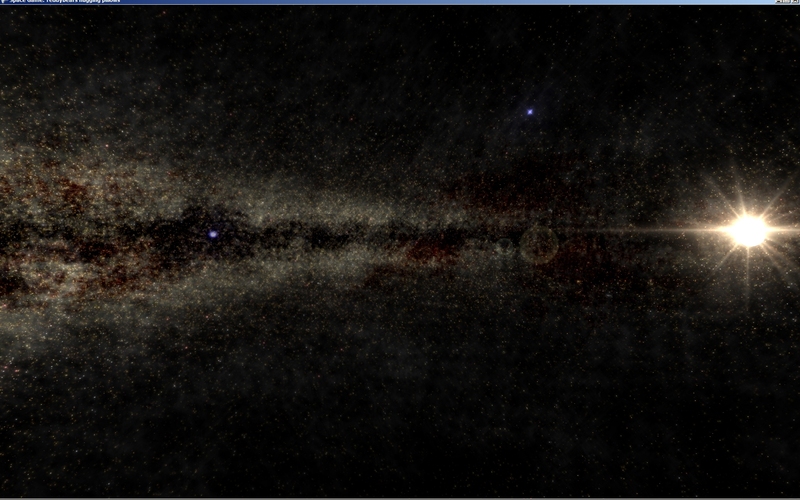 This is the result of the new rendering procedure when looking at galactic central core. 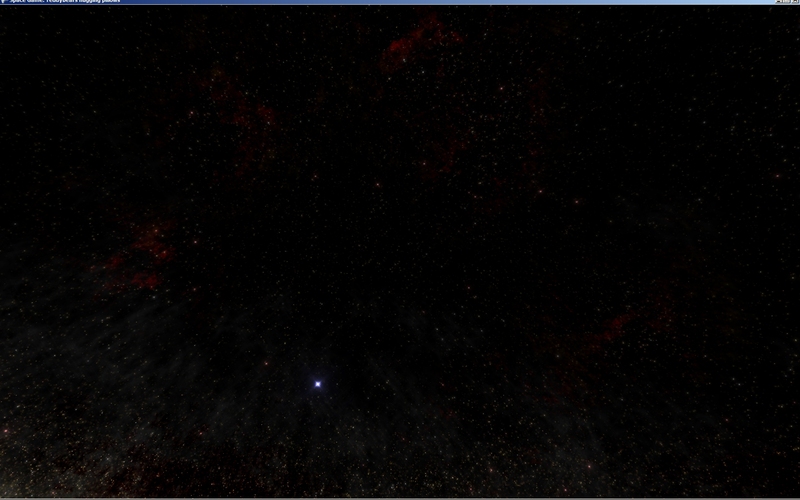 Stars are about 30% of normal brightness here, but I found raising it to about 50% looks better. The difference wasn't big enough for me to bother taking another screenshot. Turning to the right, we see some more of the red nebular gas discolouration effect. 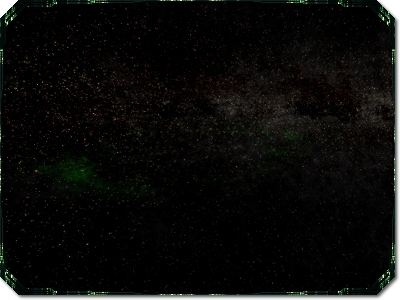 This is rendered as opaque gas that lets some red light through by burning a slightly blue-green nebula to the image subtractively. 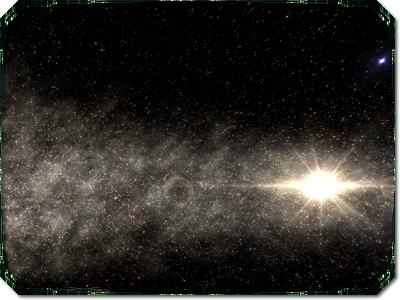 Dust and gas still tends to collect on the galactic plane along with stars. 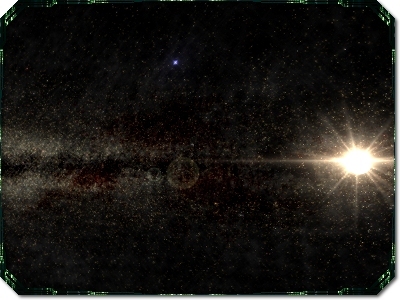 This shot faces away from galactic central core. An example of a green "hollow nebula" designed to look kind of like gas left behind by a supernova. The colour can be changed, and a gradient of other colours introduced (blue-green looks particularly good). These nebulae are drawn first and the stellar gas is burned over it subtractively so that stellar gas always draws on top. 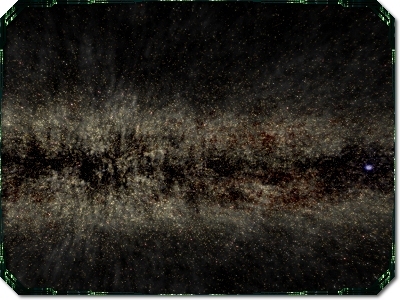 This shot shows how star density falls off with increased distance from the galactic plane, but with a minimum density level. Can also see a very feint very dark blue nebula in the background. 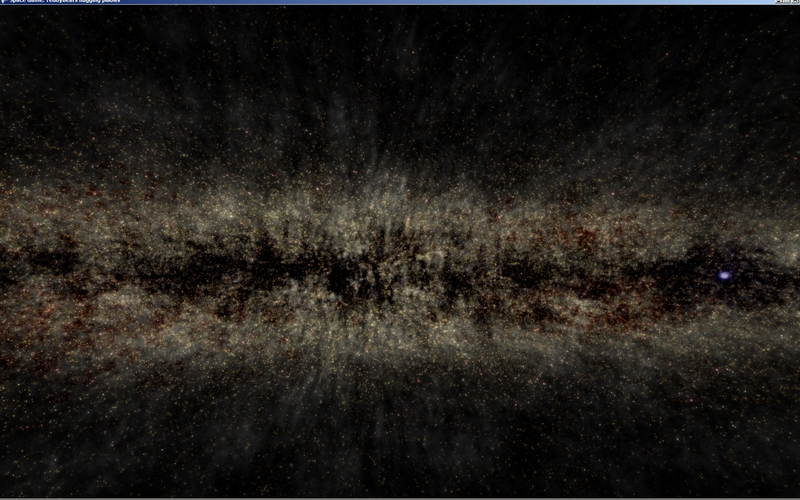 Developed a new way to distribute stars based on rough distributions observed in photos of the milky way. 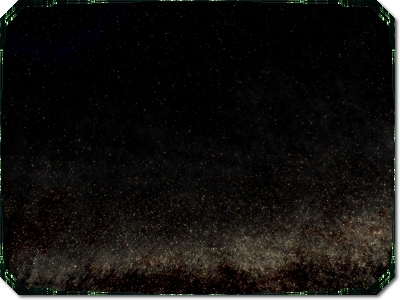 Replaced costly bloom effects that produced visual errors with a new system involving additive drawing of stars at different scales and opacities. 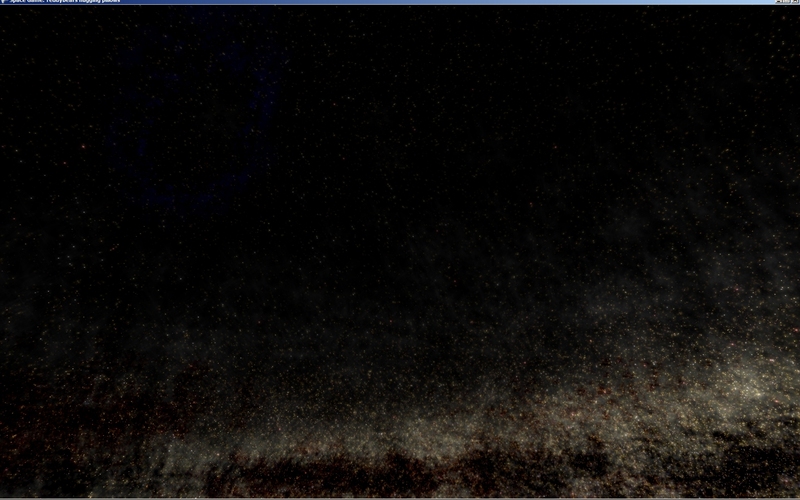 Next step is to add opaque dust, and then refine the system to look more like the milky way. 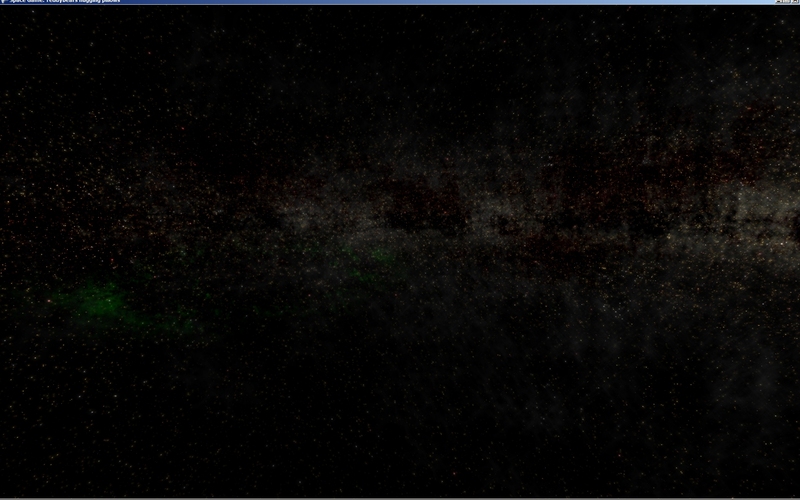 Opaque local dust clouds and nebulae will be added for some final effect. I built a system that renders a scene to the six faces of a cube using a 90 degree field of view and only view-independent drawing elements. 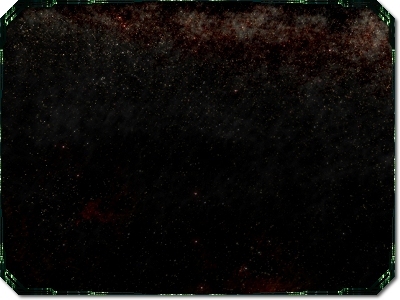 The starfield, dust and nebulae in this scene are procedurally generated, and so the system can be easily reconfigured to produce different backgrounds. 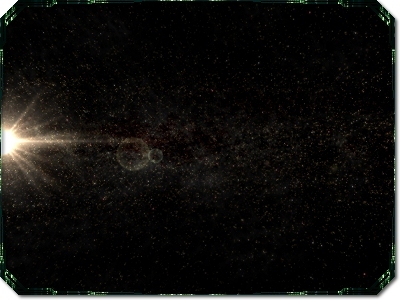 The system draws the background in small increments so that a loading screen can be played while the scene generates. 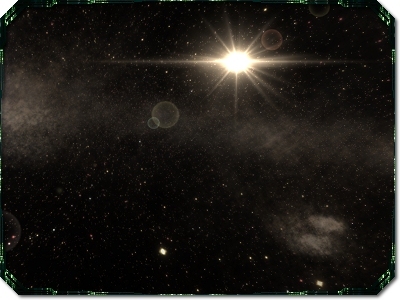 The star is a single sprite that shrinks when occluded by objects in the foreground and produces a lens flare effect when on screen. Last year I invented a new technique for rendering high-speed flyovers of procedurally generated terrain. 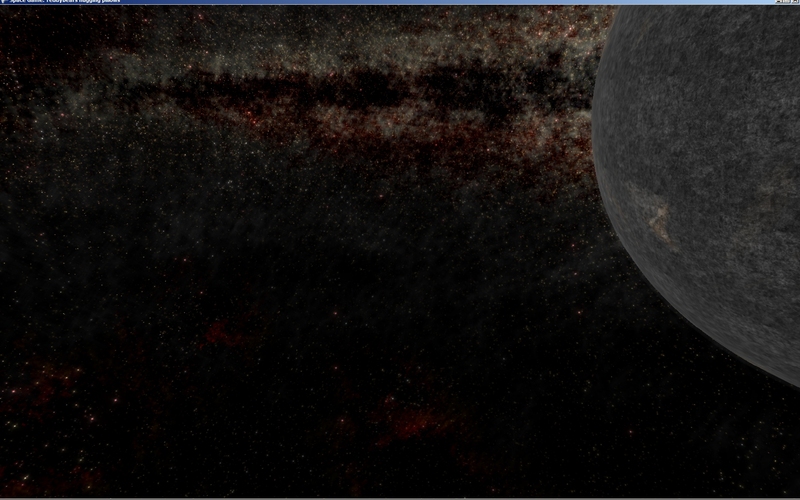 I adapted this system to render a rectangular planet projected to a hemisphere. 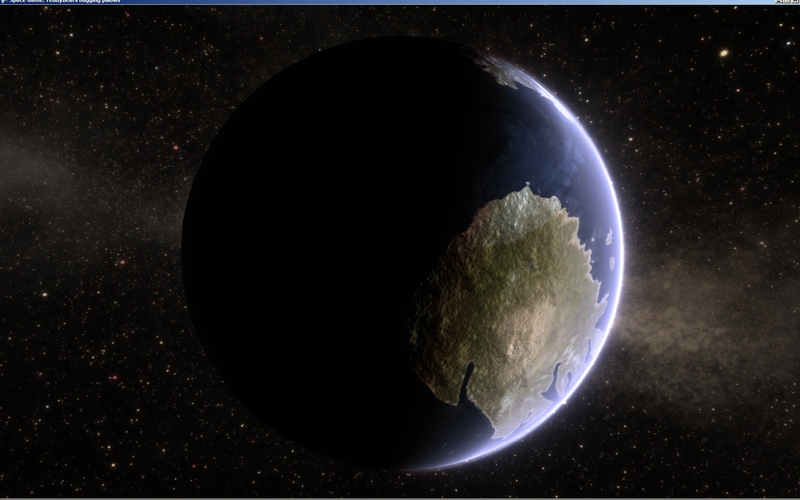 The graphics are procedurally generated based on an input heightmap, which I hope to automate the production of to make a random planet generator. 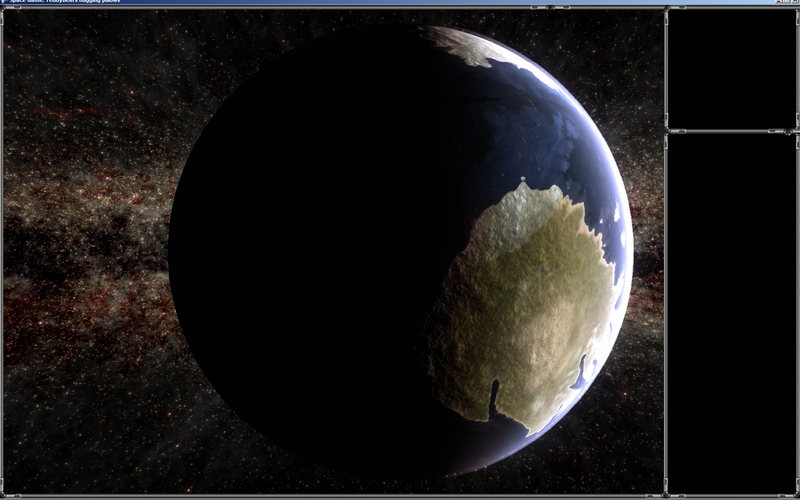 The planet can be rendered once to the background or every frame in realtime. 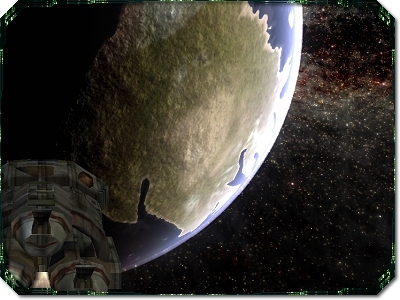 A Terran environment planet is seen in this screenshot, but the system can easily render Ice, Ocean, Barren and other types. There is currently no cloud cover, but I plan to add that at some stage. 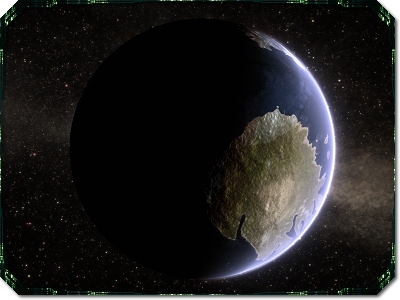 The planet renderer is more than just a purely graphical effect. 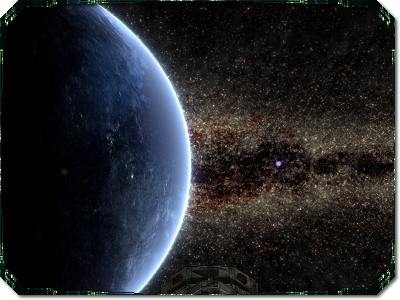 The renderer features a smooth zooming feature that introduces new detail as the player zooms in. 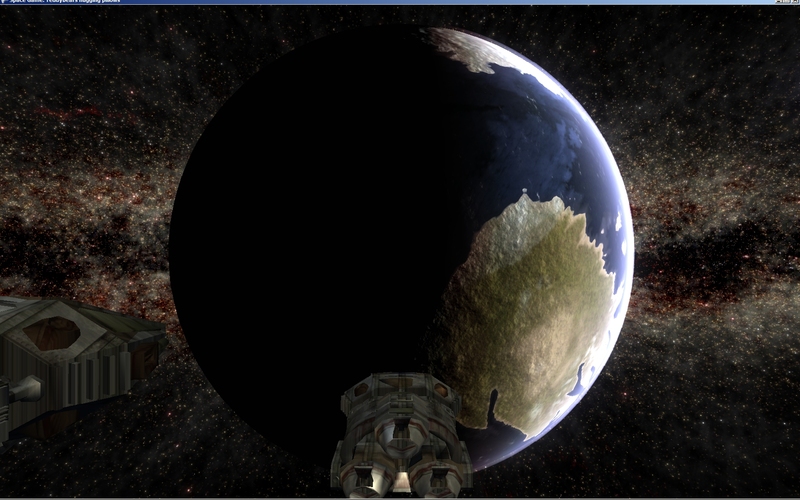 I've used this to produce a satellite-type top-down view of the planet that can be zoomed into and scrolled around. 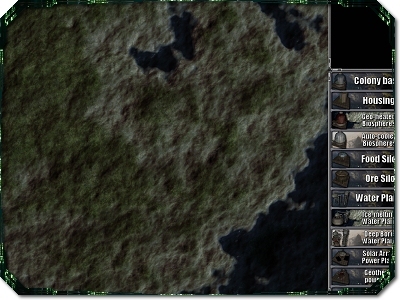 Although all of the graphics are rendered purely on the GPU, I've developed an efficient technique for extracting the xyz coordinates of any point on the terrain. 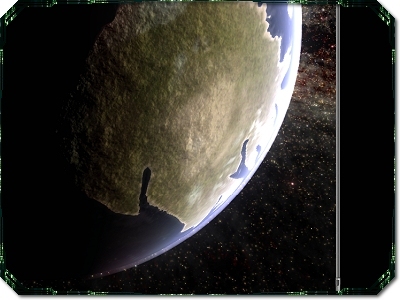 With this, models can be rendered on the planet's surface. This will be useful for rendering buildings. 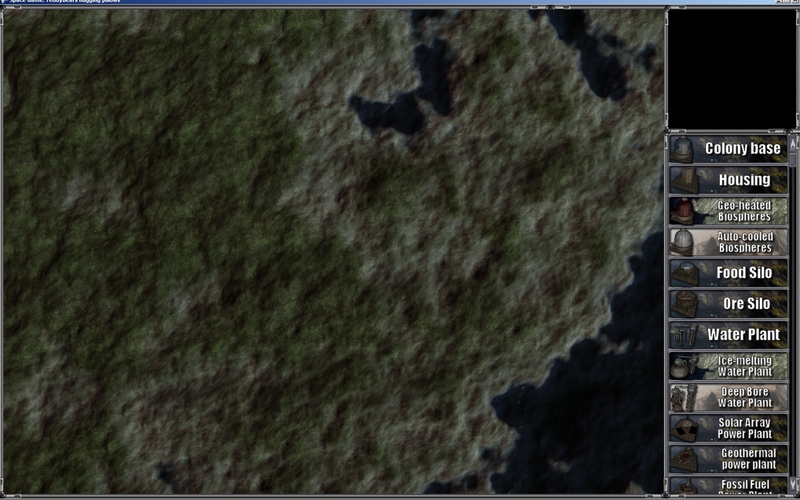 Changing water level and morphing of terrain can be achieved in realtime.